Mt. 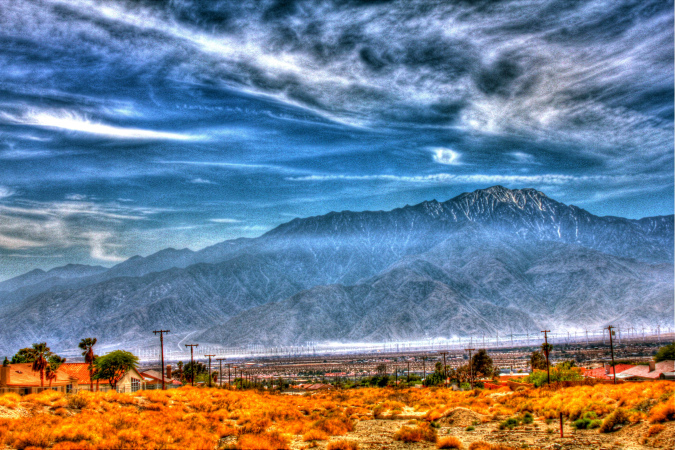 San Jacinto Peak from Desert Hot Springs – Photo by John Fraim – 1012. The most unique and quickest method for creating a story in screenplay form has never been more clearly expressed (for me) than within the screenwriting method of Blake Snyder and his Save the Cat technique of screenwriting. I’ve read all three of his books and purchased the Save the Cat screenwriting software program for my Mac. And it actually makes so much sense and I’m getting better and better at applying it. And, I might add, I’ve read most of the books out there on screenwriting and have (in fact) written a book called Hollywood Safari (Publication scheduled for 2015) about all the various schools of screenwriting. In his final book Save the Cat Strikes Back, Snyder provides two brilliant formulas for thinking in terms of creating screenplays. The simple template idea is a new discovery of Snyder, a number of years after the introduction of his first book. The 2009 book would be his last book as Blake Snyder died in 2009. Much of his brilliant method and screenwriting technique is embodied in two very simple templates that capsulize the key ingredients in cinematic story. Below, from the pages of his last Save the Cat Strikes Back, the two brilliant template formulas for writing story log lines, the first step Snyder felt the most important first step. These logline templates are contained in templates A and B below. Template Without B Story: On the verge of a stasis, a flawed hero breaks into two; but when the midpoint happens, the hero must learn the theme stated before all is lost. Template With B Story: On the verge of a stasis, a flawed hero has a catalyst and breaks into two with the B story; but when the midpoint happens, the hero must learn the theme stated before all is lost to defeat the flawed antagonist from getting away with his plan. So, decide if you want to tell and A or B story. Usually, better to tell B story as gives more room for a mentor and helper and subtext to the story on the surface. The A story of action is the action towards what the Hero wants. The B story brings out what the Hero needs. Then, decide how you might tell the news article about Ferguson in a story using one of the templates above. Once one of these are adopted, great structure for it exists in Blake Snyder’s first book Save the Cat. The structure is based around 14 key steps or scenes the story must have. A screenplay usually has 40 scenes so these are mixed in with the 14 key scenes. A story centered around a race riot in a major American city that threatens to set off riots across America. The Ferguson riots in the summer of 2014. A story based around these. With a hero and a villain. Is a state highway patrol captain the Hero in the story? Are police the villains? Whatever one might conclude about the events in August of 2014 in Ferguson, it symbolized much more than the residents of an area on the northwest side of St. Louis. Is it possible to create a new type of hero that understands the Ferguson battle for what it really is? Someone who is a modern Martin Luther King at a time when the nation so much needs this man. Is it possible for someone like him to appear again? Is it possible for movies to tell worthwhile stories to popular culture any more? Below are a few news articles as background research on this story idea. A few cautionary tales point to the frustrating racial divide within St. Louis’ suburbs that many African Americans feel is impossible to transcend. The late Tom Eagleton, longtime Democrat Senator from Missouri, in speaking to a group of NFL owners some years ago referred to St. Louis as “a raucous Des Moines,” despite its Southern pedigree (St. Louis had slavery); its role as portal to the American West (St. Louis proudly calls itself “the gateway city”); and its reputation of being more refined and “eastern” than its bigger western sister, Kansas City. Perhaps St. Louis, in its heart, is something of a mid-sized, Midwestern burg, a bigger, more lively, and urban version of Sinclair Lewis’s Main Street. St. Louis has always thought itself as current in a benign way, hardly avant-garde, but a charming, if declining, metropolis with a glorious past, when, in the 19th Century, the nation ran through this city. It’s a past that is ever receding in history’s rearview mirror. Race relations here have been managed on the seemingly civil principle of slouching away from the worst, most benighted, aspects of the past in tolerable increments that comfort the white establishment and infuriate white liberals and leftists. There was no riot here during the 1960s, when they were almost a radical rite of passage for American cities. Some might even think that St. Louis was ahead of other cities in the political progress African Americans made here in the 1960s under Bill Clay, Percy Greene, and the Congress of Racial Equality. Then comes the 21st Century and the age of Obama, and a white policeman shoots an unarmed African American teenager in the African American, lower middle class suburb of Ferguson, and the pent-up racial fury of decades breaks loose. Is St. Louis now the canary in the mine, a harbinger, or was it always behind the curve? St. Louis is a region of division: The depopulated, deindustrialized city (mostly African American) is legally divided from the far more prosperous (mostly white) county, with the city ardently seeking a reunion that the county vehemently spurns. North St. Louis city (largely African American) is estranged from south St. Louis city (mostly white) in a city that is now 48% African American. The maze of suburbs that make up north St. Louis county, where Ferguson is, is mostly African American and estranged from the maze of suburbs that make up south and west St. Louis counties, which are mostly white. Enter this iron triangle of control, neglect and racial alienation, and one uncovers several recent racial narratives that should have warned St. Louisans about what was coming—narratives about crossing the racial divide here. Metrolink, St. Louis’s light rail system, completed its second line in 2006. It provided African Americans of East St. Louis, one of the poorest cities in the country, and of north St. Louis county much easier access to the St. Louis Galleria Mall and the central cultural corridor of the city, including the hip Delmar Loop district. Concurrently, the Galleria has since seen an astronomical increase in shoplifting, and there has also been an increase in general crime and hooliganism in the Delmar Loop. This has led many to think that the Metrolink, as it has crossed racial boundaries, has enabled African American teenaged crime. This vicious cycle of young African Americans’ antisocial hostility and acting out, hardly unique to African Americans or even to Americans, and ever increasing white fear and barricade building, have intensified racial tensions, as people find the problem intractable and increasingly impossible to discuss honestly. The current riot in Ferguson is largely a war between police and the young African Americans who think cops exist mostly to prevent African American from harming whites. Another cautionary signal: In February 2008, Charles Lee “Cookie” Thornton, a lifelong African American resident of the suburb of Kirkwood, murdered Kirkwood’s mayor (who died several months later), a police sergeant, a mayoral candidate and two other citizens at a city council meeting, an act that must rate among the most horrendous political assassinations in American history. Thornton was killed by police. He was clearly deranged, but what drove him crazy was his sense of betrayal at the hands of white Kirkwood. Thornton had grown up in the all-African American Meachum Park area of Kirkwood, was a rabid supporter of Kirkwood’s 1991 annexation of Meachum Park, and was, if anything, for a time, an emblem of crossing St. Louis’s racial divide. Many of Thornton’s demons were imaginary. Yet his unhappiness, his disappointment that the racial divide within the suburbs was impossible to transcend is felt by many African American. So, Thornton, in his brother’s words, “went to war.” And so has, it now seems, a portion of African American St. Louis, triggered by a particular outrage, but largely an expression of rage against a particular set of enduring arrangements. Perhaps the problem with race relations is that the more things change, the more they remain the same. A photograph is never sufficiently proportional to truth. The truth — the full story, the context of things — is too large and complicated to be encompassed by any single image. So from Ferguson, Mo., where daily protests have erupted after Saturday’s police shooting of an unarmed African American teenager, we get only photographic data points. A man lights a rag in a bottle and prepares to throw a Molotov cocktail; militarized police sit atop armored vehicles, guns drawn and aimed at protestors who have their hands raised. Both are volatile images, and both confirm aspects of the truth: There are provocateurs among the mostly peaceful protestors, and the police have adopted a terrifyingly aggressive posture in relation to the citizens they supposedly serve. But these images aren’t coming from Egypt or the Gaza Strip or Ukraine. These are our own, homegrown documents of social unrest and they can’t, like images from more distant lands, be kept safely at bay. The manipulation of photography has become so complex and widespread that images from conflict zones often tend to cancel each other out. Propaganda has trickled down from the state to the D.I.Y. level, and it’s hard to tell the difference between the two. The resulting frustration, our inability to be certain of the authenticity of the image and the accuracy of the caption, is in many ways a relief: If we can’t be sure whether the bloodied corpse of a dead child was the result of a bomb from Hamas, or the Israeli army, we push it aside, grateful not to have to take a moral position on the conflict. The self-canceling nature of images releases us from the responsibility to think things through. The images from suburban streets here have been unreal. A police officer in riot gear, assault rifle strapped across his chest, baton in hand, staring at the camera. Police dogs, crouched in frenzied anticipation. Tear gas rising into the night sky. Armored trucks backlit by street lamps. Police have maintained the weapons and show of force are necessary to control crowds, to protect themselves and property and to avoid more looting and destruction. The photos transcend Ferguson, lean on history, and echo the conflicts of our nation’s past. But, at the same time, they also document this particular conflict, encapsulating the modern police force by its armor, masks, trucks and guns.